Keep an eye on your well water. 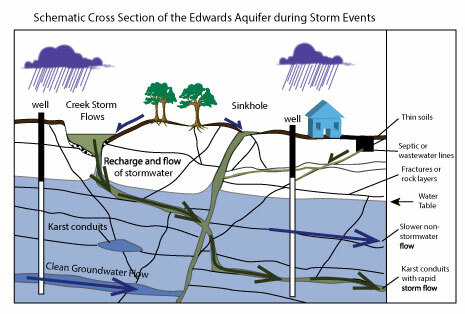 With large rain events comes lots of recharge to the aquifers. Storm water can wash in bacteria and contaminants. If you notice a change in taste, odor, or appearance of your water, switch to drinking bottled water or boil before drinking. 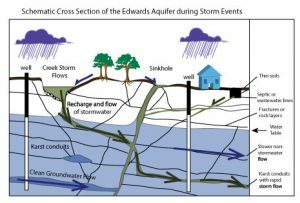 A great question on many well owners’ minds is when and/or if they should shock their wells to eliminate contaminants washed in by the storm. During rains, water can enter the well system in a number of different ways. Here they are in order of speed 1) directly from the surface from a cracked slab or damaged casing; 2) through the groundwater system if the well is directly on a conduit that receives recharge; or 3) the well is in the matrix of the aquifer. Since the contaminants enter from the surface, it depends on the well’s relationship with surface water. All well owners should use caution if they notice any changes in water after rains. Shocking is a good way to clear bacteria, but you’ll want to wait till the storm pulse has made its way through the aquifer… it could take weeks. Otherwise, you could go through the trouble of shocking to address #1 or #2, then along comes #3… and you’ve got bacteria again. Because karst aquifers receive rapid recharge with little filtration, many well owners use UV systems or chlorination to ensure no bacteria affect their drinking supply. Those who don’t should be extra cautious even weeks after rain events.